No other Chinese leader has appeared in digital battle dress uniform as much as Xi Jinping. Just two weeks after cementing his grip on power and reshuffling the Central Military Commission (CMC), an office that manages the PLA’s activities, Xi was hobnobbing with his generals again in their headquarters. That would be the nondescript five story building where a “Joint Command Center” is located. 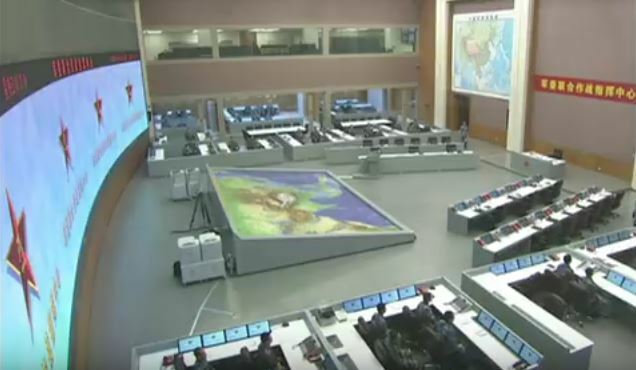 Described by state media as the PLA’s “highest operational brain,” the CMC’s command center is packed with offices and a workplace-auditorium setup equipped with interactive maps. Referring to it as “new” is fitting, since it was only launched between 2014 and 2015, when Xi Jinping began reforming the Party’s armed forces. Last week wasn’t his first time in the CMC’s main office though, since Xi’s military visits are part of his work routine. It might be tempting to assume all of this is just for show, but Xi himself held two video conferences with Chinese soldiers using the CMC’s telecoms network. 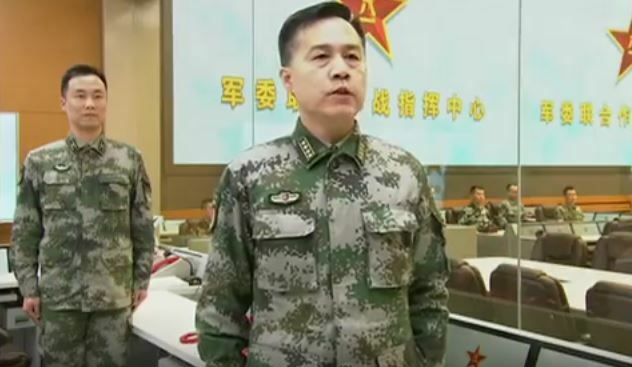 He first spoke to a border guard unit stationed in the country’s northwest and then addressed troops in Djibouti, where the PLA maintains a small base for guarding the Horn of Africa. Xi said China is at a crucial stage in its path toward being a world power and is facing a bright future as well as many challenges. Military capabilities are of strategic importance in safeguarding national security, he added. “My visit this time is to show the Central Military Commission’s distinct orientation of combat readiness,” he said. “The troops must strengthen the senses of crisis and war, and spare no efforts to improve combat readiness,” he said, ordering the military to prepare itself for emergencies from any direction. 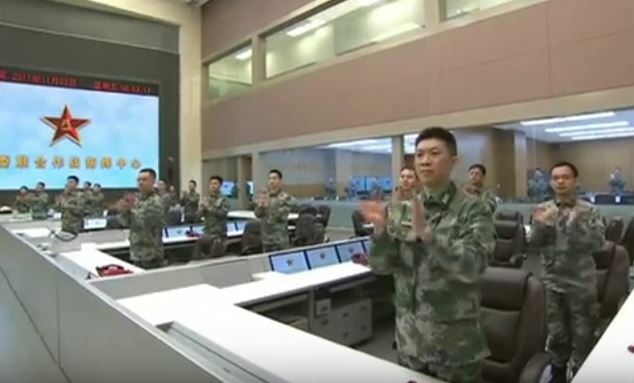 There shouldn’t be any doubt the CMC’s joint command center is fully operational and its purpose seems to be for coordinating the PLA’s movements across the globe. It’s not clear if this means China anticipates fighting a war abroad soon. Here are a few screenshots from a short state media newsclip on Xi’s trip to the Joint Command Center on November 3. 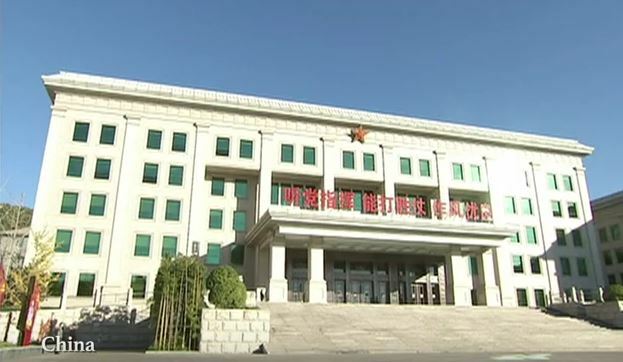 This is the HQ of the CMC. Its role is somewhat comparable to the American Joint Chiefs of Staff but in the CMC’s case, its unfailing loyalty to Xi Jinping and his goals are its main preoccupation. Via CCTV. Notice the map of East and Southeast Asia at the top right. Via CCTV. PLA soldiers scribble down notes while Xi Jinping lectures them on their role. Via CCTV. 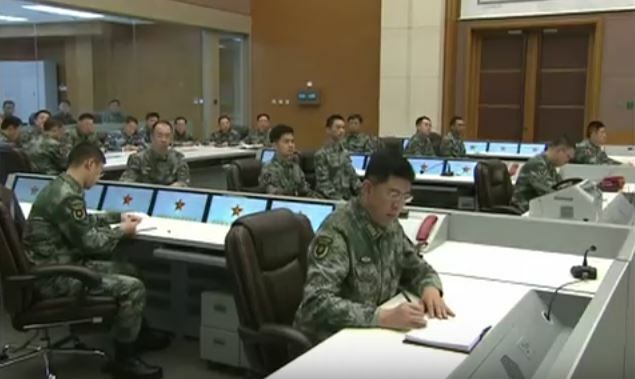 The CMC’s Joint Command Center has two levels. There are also separate conference rooms on either side of the main work area. 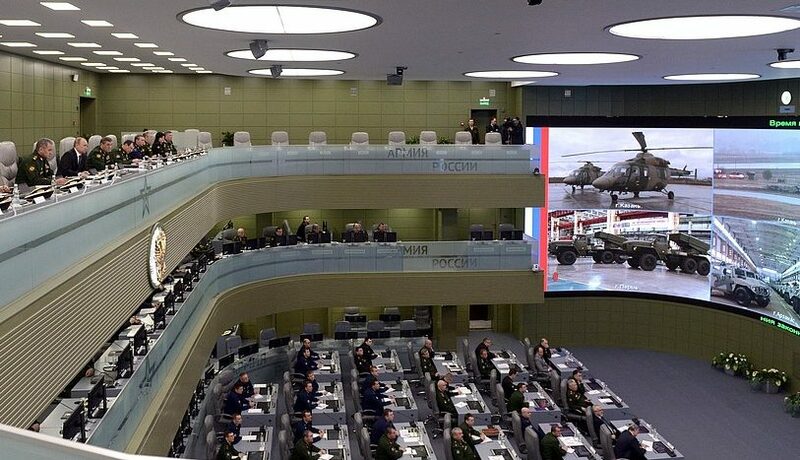 A row of large interactive screens–seen looming behind the clapping soldiers–provides real time data streaming. Via CCTV. This is the view from inside one of the conference rooms. 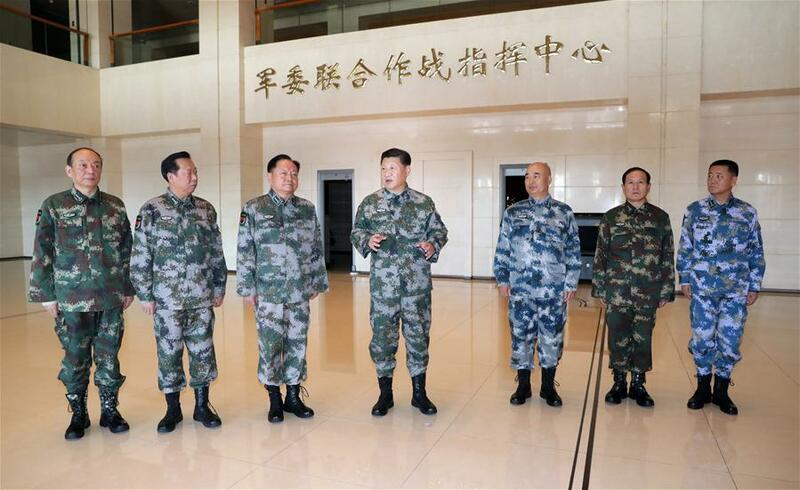 Xi Jinping was given a tour of the command center, with soldiers standing at attention in his presence. Via CCTV. Here’s a view of the Joint Command Center from the opposite end of the room, facing its entrances. The far wall supports large maps of Asia. Apparently, Xi Jinping was seated behind a podium underneath the red banner when delivering his remarks. Via CCTV. 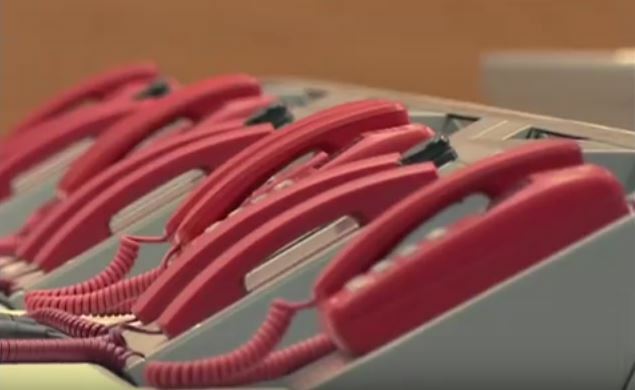 These distinctive red analog phones are found everywhere in the Joint Command Center. They might be the same as the encrypted “red phones” used by high ranking Communist Party officials. 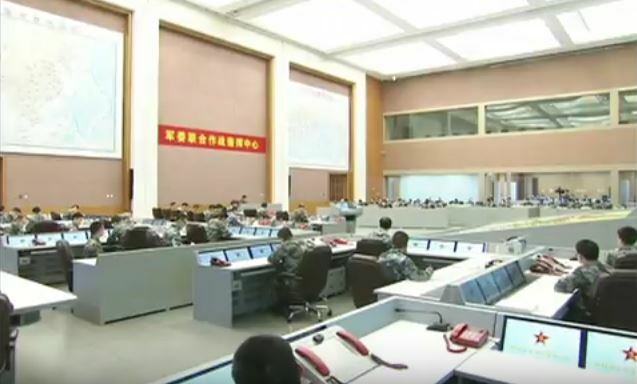 But in the CMC, the phones could be for communicating with either the five known PLA theaters in China or the 15 different offices under the CMC. Via CCTV.